Discounted registration to L2L Summit. Inclusion in the ICAK-U.S.A. Online Directory as well as the call-in referral line. Free online classified ads on ICAK-USA.com. Access to Proceedings of the ICAK-U.S.A. Annual Meeting. Discounts on future Annual Meetings (as long as member in good standing) & Muscle Testing Course Registration Fees. The International College of Applied Kinesiology® U.S.A (ICAK-USA) was founded in 1976 by a group of doctors who had been teaching others in applied kinesiology. The origin of applied kinesiology is traced to 1964 when George J. Goodheart, Jr., D.C., first observed that postural distortion is usually associated with muscles that test weak. He found that by applying the appropriate therapy, the muscles would test strong and the postural distortion would change. Since its founding, the purpose of the ICAK-USA. has been to promote research and the teaching of applied kinesiology. It is a professional organization dedicated to bringing together doctors and students with common goals and interests. The Primary Goal of ICAK-U.S.A. 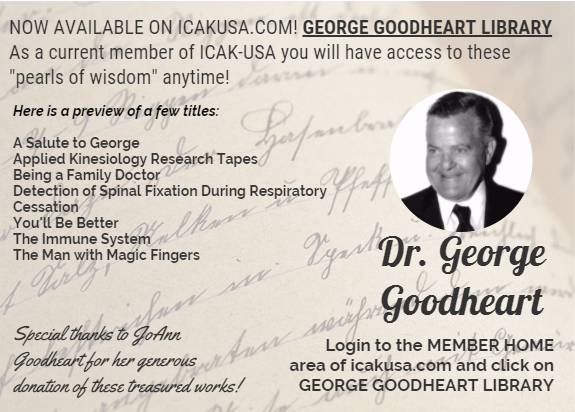 The primary goal of the ICAK-USA is to provide leadership in applied kinesiology through individual professional development and to advance education in health care. Membership offers recognition and referral, professional identity, and an opportunity for personal development. In addition to the ICAK-USA Chapter, in the mid 1980´s, the organization grew into chapters representing Australia, Canada, and Europe. In 1996, the European chapter was reorganized and now Germany, Italy, England (U.K.), Scandinavia, and Benelux are all recognized as having official chapter status.